Rainwater tanks have come a long way since the original corrugated iron tanks of rural Australia dotted the outback plains. Now you have a choice of materials, colours, designs and sizes that help complement the outside of your home. Home owners in urban Australia are encouraged to install tanks for water conservation reasons and the Government is encouraging these installations by offering rebates. Bladder tanks - commonly installed under the house or veranda, these are a space saving solution that never rusts or leaks and are algae resistant. They are manufactured from high quality reinforced PVC. They do not use a frame and you can choose from domestic irrigation or drinking water bladders. Underground tanks - are the ideal solution for storing water, they can be installed under buildings and landscaped lawns and are becoming ever popular with home owners that live on small blocks of land in urban settings. 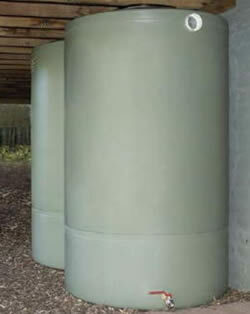 Polyethylene tanks - are available in many colours, shapes and sizes to suit you individual needs. They are made from a lightweight, strong UV treated plastic and are a popular option for quality drinking water. They come with long guarantees and if damaged are repairable. 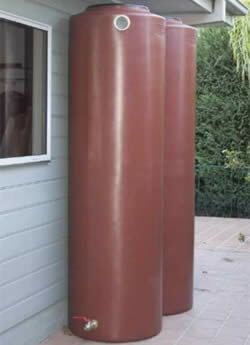 Metal tanks - these are still a popular option, however the material used to make them has changed. They are now made with quality colorbond steel and have an inner lining to prevent corrosion. They come in different shapes, colours and sizes including slimline for small space advantages. Talk to our friendly staff about your options, we will be only too pleased to help.